Kalderetang baka or some call it bakareta in short; “Kaldereta” which came from the Spanish word “caldereta” simply means stew. 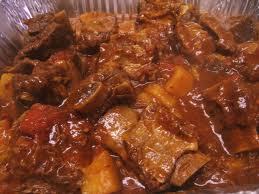 A Pinoy mouth-watering dish cooked with tender beef, potatoes, and carrots stewed in tomato sauce. This is originally a Goat Stew Cook in tomato sauce, potatoes, liver spread, olives, bell peppers and hot peppers. This has been a popularly regarded healthy dish in Northern Luzon. Now it became so popular that many versions have been made and other meat like beef, chicken, pork and even fish have been used. Beef is the most popular though. Together with the beef is the beef liver but if you can’t buy it, since we all know it’s a bit expensive, liver paste will do. It will give the dish a complementary texture and taste. Some usually do this dish with coconut milk and with an extra chili flavor. It is the modified version of Kalderetang Baka, but still it’s your choice if you want to put coconut milk on it. Since the beef here is the main ingredient, did you know that beef is a good source of zinc, which is helpful for preventing the damage to blood vessel walls, which can contribute to some heart diseases and is also needed for the proper functioning of immune system. Kalderetang Baka, with all of its health benefits, mouth-watering taste is usually served as an all time favorite dish in household in regular days or special occasions such as Fiestas and other celebration. So, be ready to share this dish with your family and friends. Have a nice cooking! Add in olives, and diluted cornstarch.